FREE 4 ounces Dead Sea Salt from Israel for your kitchen. *Your Bonuses are listed in the product descriptions below and only this webpage. 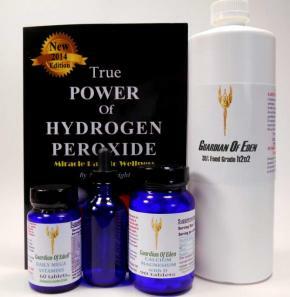 Beware of immitators: Guardian Of Eden (R) is the only 35% food grade hydrogen peroxide recommended by The Power of Hydrogen Peroxide, Miracle Path To Wellness by Mary Wright, and only 35% food grade hydrogen peroxide is recommended in all medical studies and qualified publications. Do not fall for buying less than 35% or excuses why it has been diluted. Federal law now requires merchants of 35% concentration hydrogen peroxide to be licensed. Sellers who are not legitimate businesses can not be licensed. So instead they make excuses for not selling 35%, claiming theirs is 34.5%, 32% and other concentrations made from 35%. However, obviously if they can not purchase 35% legally, they do not have 35% to dilute from. When you read excuses of why a merchant is selling less than 35% don't fall for it. It is almost certain it is neither made from 35% nor that it is food grade. 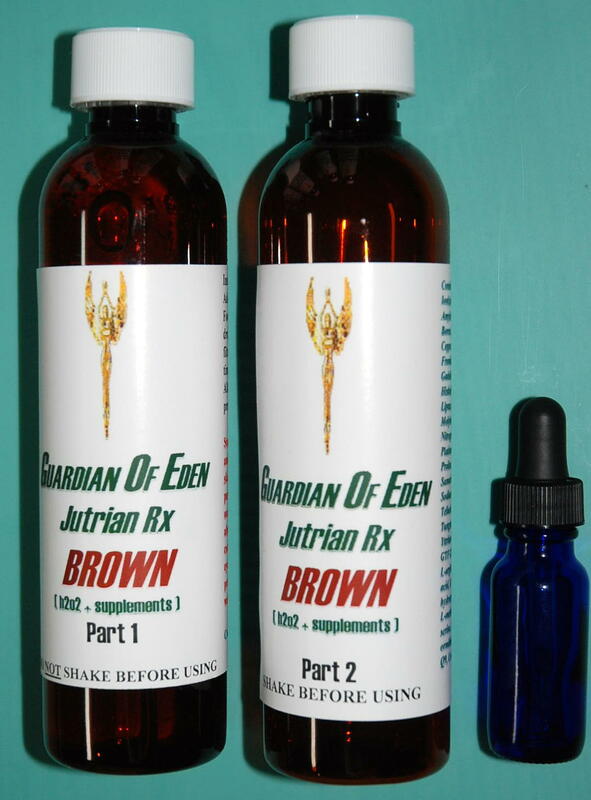 Guardian Of Eden (R) is the only 35% food grade hydrogen peroxide recommended by The Power of Hydrogen Peroxide, Miracle Path To Wellness by Mary Wright, and only 35% food grade hydrogen peroxide is recommended in all medical studies and qualified publications. It has been listed as a source for 35% food grade hydrogen peroxide by Dr. Rowen's Second Opinion Newsletter. The benefits of 35% food grade hydrogen peroxide has been presented for decades from such authorities as Dr. David G. Williams and in many authoritative books including Hydrogen Peroxide: Medical Miracle by William Campbell Douglass II, Flood Your Body with Oxygen by Ed Mccabe and Hydrogen Peroxide & Ozone by Conrad LeBeau. Best Selling Author Kevin Trudeau has publicly stated specifically that he personally uses G.O.E. 35% food grade hydrogen peroxide daily. (Video link is below). 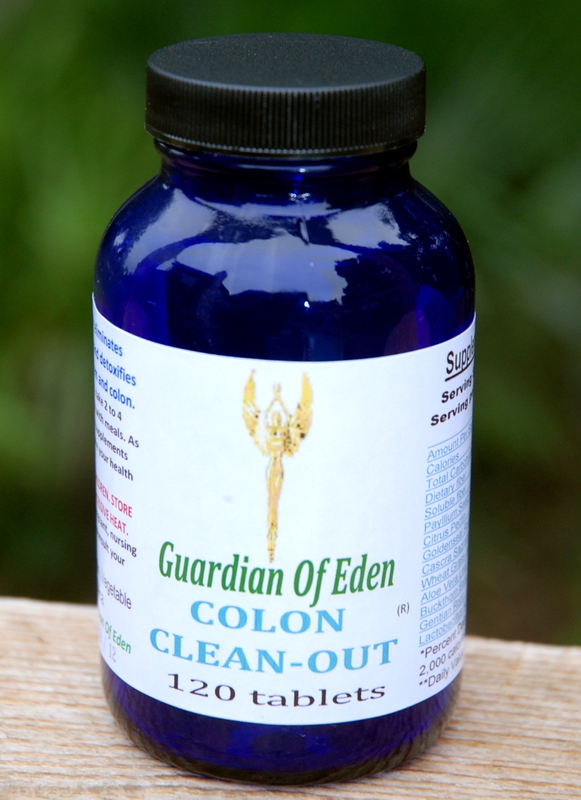 Guardian Of Eden (R) 35% Food Grade Hydrogen Peroxide is true certified 35% Food Grade hydrogen peroxide. G.O.E. 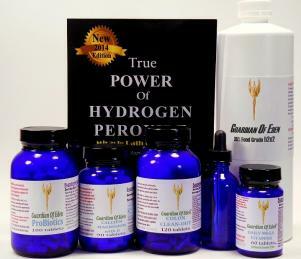 has been selling LEGITIMATE & CERTIFIED 35% FOOD GRADE HYDROGEN PEROXIDE ONLINE SINCE 1988 - 100,000+ customers and growing. Why? 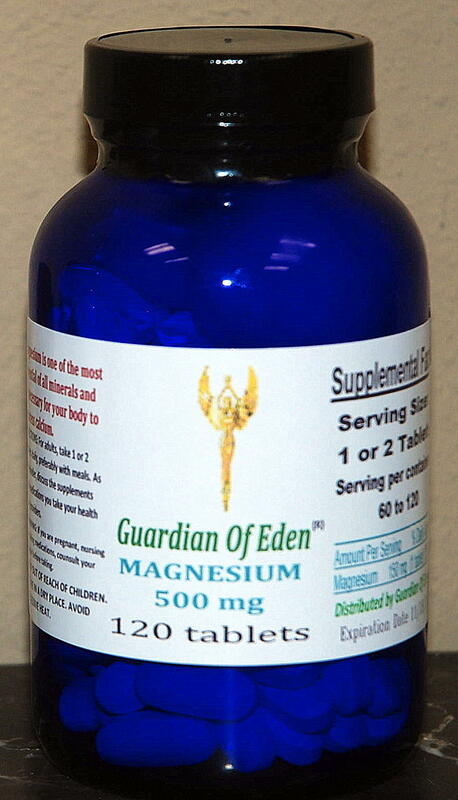 Because of Guardian Of Eden quality. Pure. Legitimate. Fresh. Endorsed. The company name "Guardian of Eden" refers to the Biblical angel left to block admission back into the Garden. In their product line, G.O.E. pursues re-creating the nutritional environment when the earth was new and pure. 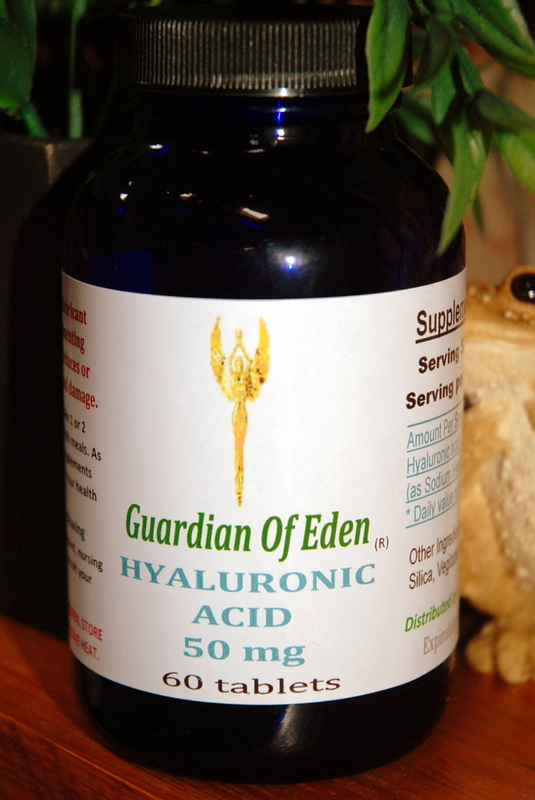 Guardian Of Eden 35% concentrated hydrogen peroxide is densely packed with oxygen molecules - the working agent of h2o2. A little goes a very long way. G.O.E. also offers a cellular nutritional hydrogen peroxide (Jutrian Rx) which is the most extraordinary hydrogen peroxide supplement available and is at the cutting edge of performance, anti-aging and curative applications and other cellular level heath supplements. H2O2 has numerous uses. Many are mentioned below, but there is a list of many other uses of H2O2 at this link: Click here. PLEASE NOTE: THESE PRICES WILL LIKELY SOON INCREASE... OUR COSTS HAVE INCREASED 38% in the last 120 days as h2o2 production is very energy usage intense and shipping costs increase whenever gasoline prices increase - so within a few days the prices will increase (sorry) for future listing. However, we do not raise prices on remaining inventory and any price increases will only reflect increased costs to us of future inventories. If refrigerated, h2o2 reduces in strength less than 1/2 of 1% per month and will never spoil. If you use quantities of h2o2, you may wish to add to your stock. Any HAZMAT charges are including in the prices below. NOTICE: 35% Food Grade Hydrogen Peroxide has not been banned. There has been a product safety enforcement crack down that has forced many deceptive online sellers that we have warned of for many years to try to trick people into buying lesser concentrations falsely labeled as food grade. We HIGHLY urge not purchasing any Food Grade Hydrogen Peroxide other than 35%. We can not understress this. Most lesser concentrations sold online are not food grade and contain health destroying industrial additives, stabilizers and free radicals that are odorless and tasteless, despite what the seller printed on the labels. 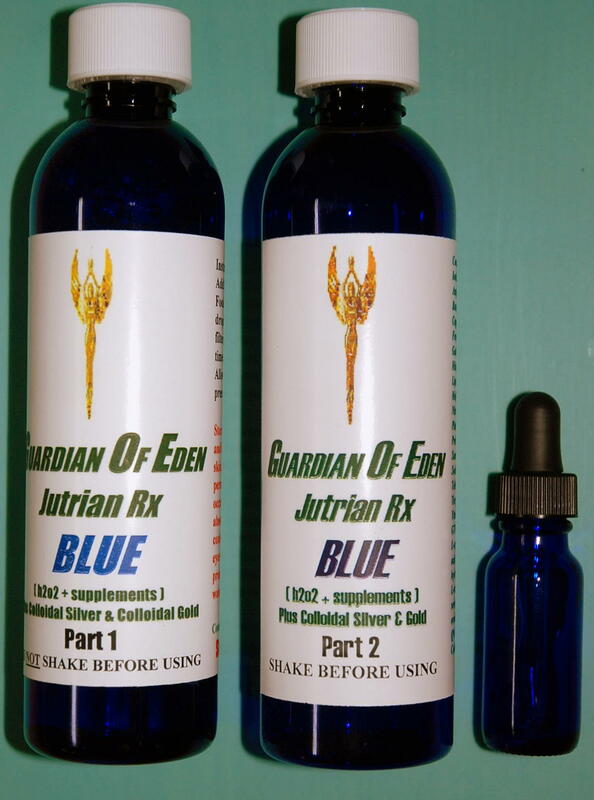 Guardian Of Eden 35% hydrogen peroxide is packed with releasable oxygen atom - the working element of h2o2. The product description and contents are only pure, undiluted 35% Food Grade Hydrogen Peroxide that has been bottled into consumer sized containers less than 30 days before shipment. LIMITED TIME SPECIAL ON 2 QUART ORDERS! You receive a FREE copy of the book the True Power of Hydrogen Peroxide, Miracle Path to Wellness by Mary Wright and more. (Retail $27.95) to your 4 quart order. Peroxide measures the Peroxide (shock) level from 0 to 90 ppm in pools or spas with instant results. WHAT IS THE FASTEST GROWING USE OF 35% FOOD GRADE HYDROGEN PEROXIDE? ANSWER: For Pools, Spas, hot tubs and foot baths to avoid the harmful (and smelly) effects of chlorine and beach based treatment. Chlorine and bromine based pool, spa and hot tub chemicals are among the most documented health damaging chemicals. PLEASE NOTE: This article is for information purposes only and is not intended as a substitute for medical advice. You should consult with a physician or other health-care professional familiar with nutrition, prevention, and related health issues. Any product or statement on this or any linked web site has not been approved by or have not been evaluated or certified by the Food and Drug Administration (FDA). These products are not intended to diagnose, treat, cure or prevent any disease. Products are not offered specifically for medical purpose. Always consult your medical practitioner prior to using any substance or product for any medical condition including any product mentioned or offered here. The FDA has not approved the usage of hydrogen peroxide for any medical purpose. What is 35% Food Grade Hydrogen Peroxide Jutrian RX? In the 1950s, agricultural agencies warned that agricultural land was depleted of minerals. Plants can not produce minerals - only pull them from the soil. In a natural cycle, these return to the ground with each generation. But decades of agricultural use in which the decayed plants do not return to the soil, the ground becomes depleted of minerals in our food supply. Once depleted, while the plants still grow in short life spans they are devote of minerals. If you read the labels on even fresh fruits, grains and vegetables you know that there are little to no supplemental value in the food we eat. The understanding of the necessity of these vital nutrients for health, energy and even mental process dates back to ancient Rome, Greece and Egypt, when it was understood that the best grains came from river deltas - where every year the soil is replenished in annual river flow in which minerals and nutrients are washed down river to settle on the delta. Animals instinctively seek out mineral rich rocks to lick and the longest lived people in the world either eat food from areas of land revived by nature or by the sea. Lack of proper nutrients are a primary cause of the near geometric increase in obesity - we eat so much because we are nutritionally starving and our bodies demand we eat more. But what the body is calling for is not more fat, carbohydrates and sugar - but nutrients essential for cellular health. Degenerative diseases are growing nearly geometrically although our grocery stores offer huge varieties of food and most people take general vitamin pills. Why are so many people seriously overweight? Why do the super rich and wealthy movie stars seem to live so long and so well? Why is our society increasingly racked with pre-mature old age and an even early age physical degeneration? Read www.dfwx.com/goediscuss.html for more comments. The oxygen content of the atmosphere is 30% less than just 200 years ago - a result of the industrial age and heavy burning of petroleum - while oxygen producing plants lessen in volume - plus the harms now of air contamination and toxins. Oxygen is vital for proper health - with the most common initial emergency health measure to give someone being oxygen as it is generally very good for a person. G.O.E. pursues ways in which people can nutritionally return to the Garden of Eden. While other companies offer endless new diet pills and chase each other to offer the next nickel pills and solutions, G.O.E. goes back to the origins of life and nature. What is more obvious and makes more sense. 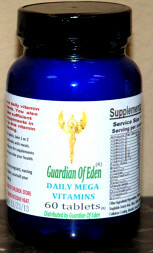 Visit Guardian Of Eden's Health & Dietary supplements page for G.O.E. 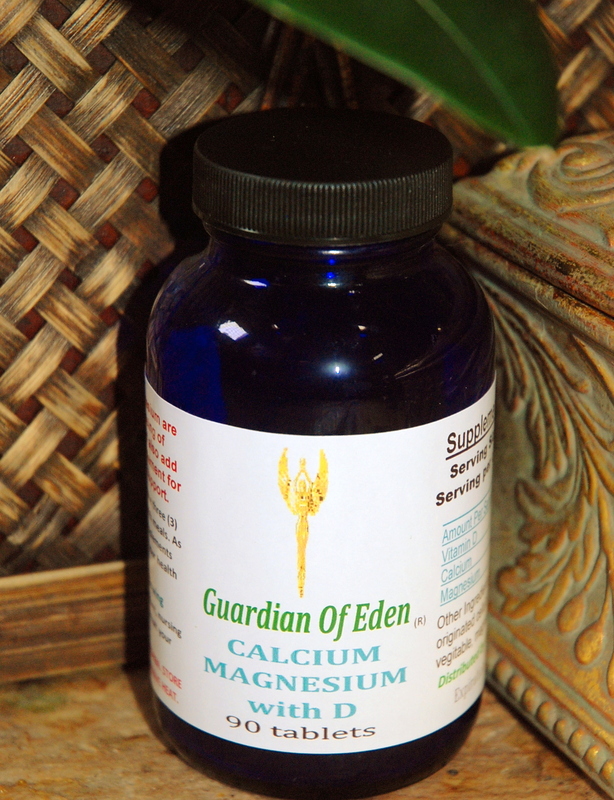 's Calcium w/ Vit D & Mag, Mega Vitamins, Hyaluronic Acid, Colon Cleaner, Veggie-Caps & Magnesium. Click here. ALSO NEW: Our 35% Food Grade Hydrogen Peroxide Health Kits and Packages - Less that $1 per day! - Click here. The most potent food grade hydrogen peroxide ever offered by any organization or company and is the premier 35% Food Grade Hydrogen Peroxide for health supplementing and wellness issues. Some people find 35% food grade hydrogen peroxide for sale at exorbitant prices and tragically order it for personal, internal usage. Typically, this is old, decomposed hydrogen peroxide with stabilizers (including chemicals and heavy metals) particularly harmful to ingest internally. Worse, what is sold often is not 35% or FOOD GRADE. We often receive thank you email from h2o2 users - whether for oral supplementing or other usage. Quality Food Grade hydrogen peroxide is increasingly hard to find. Most selling online are new sellers operating out of there houses and are not selling Food Grade, but industrial grades they bottle and put a food grade label on themselves. H2o2 does not have the urine smell of ammonia or burning aroma of bleach. Because it does not smell like urine as ammonia products do, dogs and cats particularly will appreciate using h2o2 as a cleanser than any ammonia product, and bleach fumes burn a pet's sensitive noses far more than people. To a dog or a cat, a house cleaned with ammonia spells like an outhouse. H2o2 is excellent for bathing and G.O.E. has a product specifically for this purpose (it is wonderful and you should try an h2o2 bath at least once - your skin will love you for it and you will feel the difference!) Hot tub and spa owners are switching to hydrogen peroxide by the tens of thousands each month to eliminate the usage of toxic chemicals in the water and then also in the steamy air around it. In the history of humanity, no one bathed in hot chlorine and bleach sauna for their health - yet these chemicals are promoted for pools, spas and hot tubs. Hydrogen Peroxide is a basic element. H2o2 is comprised only of water and oxygen - and what is more people friendly, nose and skin friendly and healthy friendly - compared to toxic bleaches, chlorides and ammonia. Who uses h2o2 instead of bleach and ammonia? Tens of millions of people. Fine clothing manufacturers. Even furniture refinishers who are smart enough to know that using bleaches and petroleum solvents will very quickly take a terrible toll on their body - internally and externally - and h2o2 is very powerful for their goals as a working solution. The best of the organic food suppliers use h2o2 to wash their produce. H2o2 also is used for organic farming on a personal and commercial level. Plants like the cellular energy of h2o2 and the h2o2 sterilizes soil of micro pests without any environmental and food contamination danger. H2o2 is outstanding for house plant care. While h2o2 is the premier soil treatment, no one used bleach for their gardens and plants. If bleach kills plants, imagine what it does to the cells of your body? This is the miracles of h2o2. It is simply hydrogen and oxygen - water (h2o2) with an extra oxygen molecule attached (h2o2). That molecule is the working agent and there is so much power that it can power rockets into space. Yet its core molecular structure is the perfect environmental elements - Oxygen. Water. If in doubt, try the smallest quantity for yourself as a replacement for bleach and ammonia you use. Take a bath with a bit added to the water. Add just a few drops to your house plant water. You will quickly see the benefits. If you are tired of your kitchen and bathroom smelling like a chemical factory after mopping, your skin flaking and white and your eyes stinging after being in your spa, this is the alternative. 35% Food Grade Hydrogen Peroxide Usage - the many different usage and how to use 35% Food Grade h2o2 -click here. Answers to common questions about storage and applications such as storage and safety - click here. 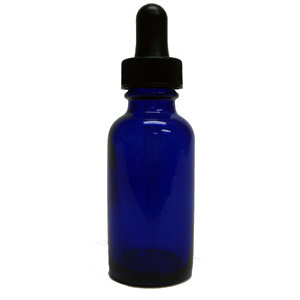 To read of various issues and the theories of oral h2o2 supplementing - click here. NEW SECTION - TO READ DILUTION RATIOS AND MANY OTHER USAGE OF H2O2. This is not a plastic bottle or a plastic dropper, but real blue Cobalt glass with clear glass eye dropper. PLEASE NOTE: Dropper bottle orders (no limit) shipped ONLY with orders for any other G.O.E. Product due to shipping costs. The U.S.D.A., F.D.A. nor any other governmental agency has neither approved of nor banned personal hydrogen peroxide internal therapy. NO COMPANY, INCLUDING G.O.E., CAN CLAIM TO OFFER CURES FOR CANCER, ALZHEIMER'S, or any other degenerative disease. Theories of health care and alternative health care are disputed and are matters of personal and professional decision. UNDER NO CIRCUMSTANCE should you exceed the maximum concentrations stated. READ SAFETY MATERIAL CAREFULLY. WHAT IS "FOOD GRADE" HYDROGEN PEROXIDE? DRUG STORE & HAIR DYING HYDROGEN PEROXIDE? WHY IS HYDROGEN PEROXIDE NOT SOLD IN HEALTH SUPPLEMENT STORES? CAN A PERSON REFINE THEIR OWN HYDROGEN PEROXIDE? GUARDIAN OF EDEN STATEMENT: This is very interesting unique perspective. PLEASE NOTE: These articles are for information purposes only and are not intended as a substitute for medical advice. You should consult with a physician or other health-care professional familiar with nutrition, prevention, and related health issues. Any product or statement on this or any linked web site has not been approved by or have not been evaluated or certified by the Food and Drug Administration (FDA). These products are not intended to diagnose, treat, cure or prevent any disease. Products are not offered specifically for medical purpose. Always consult your medical practitioner prior to using any substance or product for any medical condition including any product mentioned or offered here. The FDA has not approved the usage of hydrogen peroxide for any medical purpose. 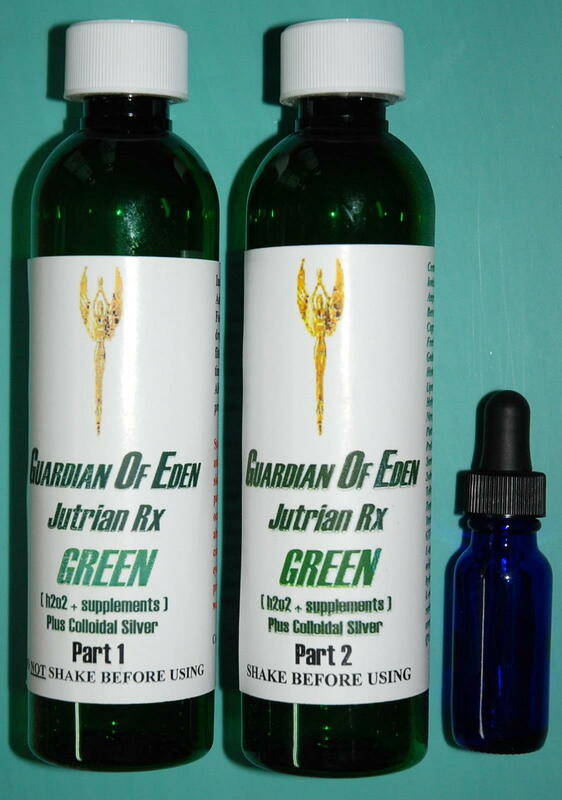 WHAT IS GUARDIAN OF EDEN'S BODY PURIFICATIONTM? Your skin. The average adult has over 20 square feet of skin, 7 layers thick. The human skin also is one of the most critical and NEGLECTED human organ in personal health care and wellness. Skin is not a plastic wrap around your body. It is by necessity porous - both ways. It breathes in air (literally). It breathes out. It expels waste, fungus, bacteria and viruses - plus is your critical first line of defense against such invasive micro-organisms. Your skin is necessary for the processing of certain vitamins and minerals. Skin is an essential part of a person's natural immune defenses. The health of your skin is what most defines how healthy and how old a person appears. Although an unpleasant topic, the human body is covered with billions of tiny body mites. Many believe they are a major cause of skin aging and blemishes. Like all living creatures, they also excrete wastes - which then become sources of micro bacteria and fungus causing micro infections, clog pores and skin breathing, and prevent proper release of dead and replaced outer skin cells. Ordinary soap and hot water will not remove these mites. Using alcohol over your entire body would not only be VERY unpleasant and potentially dangerous, but also would have a terrible skin drying effect by removing necessary oils of healthy skin. There is virtually no manner to remove or cleanse from these mites and all that continues to accumulate with them. 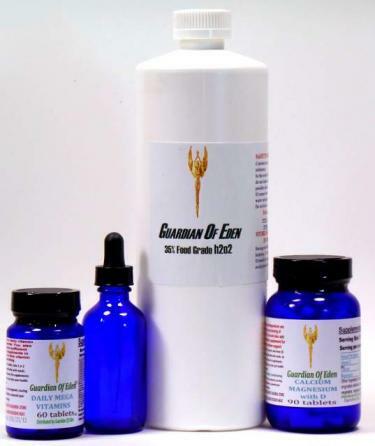 G.O.E Body Purification removes those present and the wastes and residual bacteria and fungus that has accumulated and otherwise continues to accumulate. This also then allows our skin to breathe and uncovers our new, healthy skin, rather than always under layers of dead cells, waste excrement, fungus, bacteria and accumulated body sweat salts and oil. A relaxing bath with G.O.E. 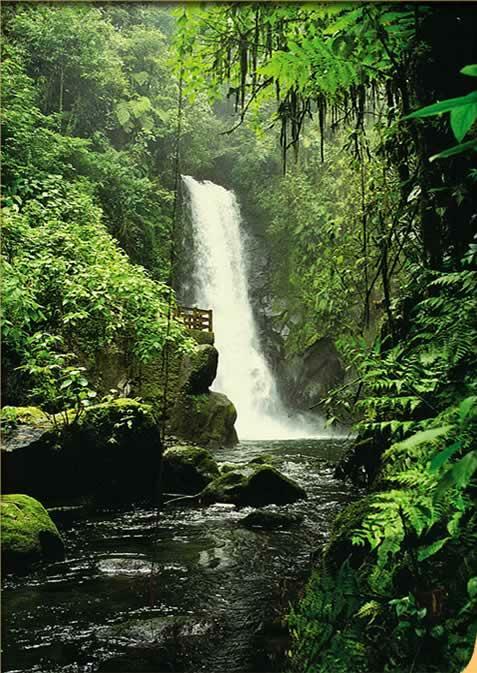 Body Purification after a physical workout or activities causing sweating is particularly refreshing and beneficial. G.O.E. 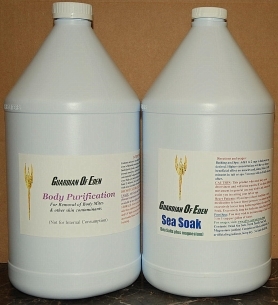 "Body Purification" is based upon G.O.E. Hydrogen Peroxide that also contains ingredients to allow absorption into the outer layers of skin to kill and wash away these mites, their wastes, and corresponding fungus and bacteria. There also is a wonderful cleansing feeling from this and from oxygenating your healthy outer skin. In Gallon size. Each gallon is good for 8 full baths. This represents only a tiny fraction of what one massage would cost and you should experience the sensation of an h2o2 bath. It is NOT necessary to use h2o2 for every bath and is recommended for once every two weeks or after activities causing substantial sweating. May be used in conjunction with G.O.E. 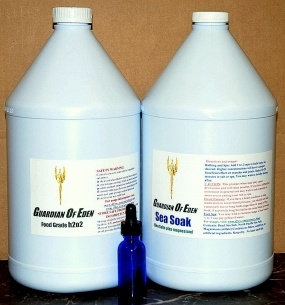 Sea Soak for muscle relaxation. It should not be used in conjunction with shampoo or hair conditioners. (This would not damage your hair, but could neutralize the cleansing agent.) If you are going to shampoo and condition at the same time, it is recommended you do this first and then start with fresh water for the h2o2 bath. In over 25 year this is the finest book on the topic of 35% food grade hydrogen peroxide therapy we have seen - and then reveals step-by-step guidance on your personal path of whole health and wellness in specific. 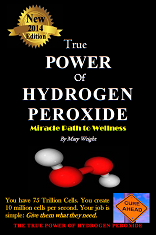 We can state this is excellent exploration material and we highly recommend that you read the True Power of Hydrogen Peroxide, Miracle Path to Wellness. We will send it to you at no additional shipping charge. We are a Verified Online Merchant - a guarantee of delivery or refund of your purchase for no-risk online purchasing. We cannot and do not ship anything to Alaska, Hawaii or any foreign country. There are no exceptions. We will only ship to the lower 48 continental United States. We cannot ship to any military base or local, state or federal government facility. All shipping is by ground shipment only. We cannot ship overnight or by air shipment. Shipping usual takes 3-5 days, but may take 7-10 days. The Canadian Department of Natural Resources has requested that we advise on our website that hydrogen peroxide of 30% or higher concentration cannot be shipped to Canada without special authority and reporting. We do not ship hydrogen peroxide in concentrations of 30% or higher to Canada under any circumstance. Do not want to use Credit/Debit/ATM card? YOU SHOULD NEVER, UNDER ANY CIRCUMSTANCE, INJECT HYDROGEN PEROXIDE INTO YOUR BLOOD STREAM and should NEVER use hydrogen peroxide internally without first consulting your qualified physician or healthcare provider. Misusage of hydrogen peroxide can cause permanent injury or death. For more information, see www.dfwx.com/usage.htm and www.dfwx.com/answers.htm for usage information andsafety precaution of hydrogen peroxide. Copyright 2018 © : All materials on this site are copyrighted by DFWX & Guardian Of Eden and may not be reproduced without permission.